In 1984, Maine native Jeff Butterfield and fellow New Englander Casey Newman opened GALE FORCE CLIMBING in Bar Harbor -- the first independent climbing school ever established in Maine. Operating out of a small storefront on Main Street, GFC tried mightily to convince visitors to Bar Harbor and Acadia National Park that rock climbing was a sport worth experiencing. Surprisingly, despite millions of seasonal visitors to the area, the pair discovered they were at least a decade ahead of their time: back then, the average visitor preferred window-shopping and a drive around the Park Loop Road to outdoor physical activity. After just two seasons of operation, GALE FORCE CLIMBING closed its doors. Over the next decade things in Bar Harbor slowly started to change. By 1994 (ten years after GALE FORCE CLIMBING) rock climbing had moved from fringe sport to mainstream activity, fueled in part by the indoor climbing gym phenomenon that had swept the country. Local resident and experienced climber Chris Kane, decided that the time was right for Bar Harbor and Acadia National Park to once again have a resident climbing school. ATLANTIC CLIMBING SCHOOL was born. By 1995, its second year of operation, ATLANTIC CLIMBING SCHOOL was so busy that Chris asked Jeff Butterfield to join him as a climbing guide. In 1997 Jeff became a 50% owner of ACS, and in 2000, Chris returned west to pursue other interests and sold his share of the business to Jeff Butterfield. After almost 15 years of service as a guide and over a decade of ownership, Jeff has turned ACS over to the next generation of local climbers. 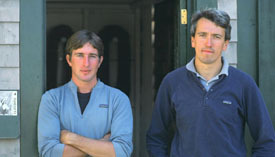 Eli Simon and Pete Fasoldt, both of Camden, Maine, began guiding for Atlantic Climbing School in 2005 and 2006 respectively, and purchased ACS inc. in 2009. At the end of the 2011 season Pete moved to California to persue other interests and sold his shares of the company to Eli.